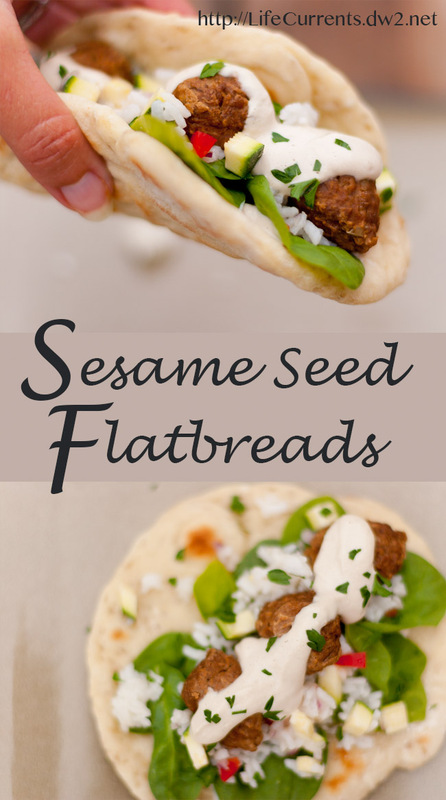 The Sesame Seed Flatbread story: I’m working on some new sauces, and this week I tried sesame seed sauce. I decided I wanted to serve it with couscous, veggies, and something else. But, I wasn’t sure what that last part was going to be. Until I saw a recipe for flatbread through the King Arthur Flour catalogue. The only problem was that the recipe called for Indian flatbread flour. Now, I’m all for using the right flour for the job. But, come on, I already have at least 6 different kinds of flour in my kitchen. Do I really need another? I decided that the answer to that question was no, I didn’t need yet another kind of flour. So, I did a little experimenting with some all-purpose flour in the flatbread instead of the specialty flour. When I kneaded and rolled out the bread, I also used whole wheat flour to give it a little extra body and texture. And, you know what? The flatbreads were great. Easy. Soft. Super tasty. I’ll totally make these again. You could mix up the seeds inside the flatbreads, adding flaxseeds, poppy seeds, pepitas, sunflower seeds, or any combination you like. I bet wheat germ would work well too. As for the sesame sauce that instigated this whole meal? Eh, it was alright. The husband said he would rather have hummus. I agree. So, next time I’ll make some hummus to go with this meal. Oh, and you may notice in the picture that it’s actually rice rather than couscous. When I went to the cupboard to get (that I surely knew was in there) the couscous, it turns out that I didn’t actually have any in there. Oops. So, I made rice with chopped up veggies instead of couscous. And, you know, even with all those “mistakes”, the meal was fabulous. Yep, there’s the rice that I used rather than couscous. Oh well, it was great anyway! In a medium bowl, stir together the flour, salt, yeast, and sesame seeds together. Using your fingers, work in the soft butter and water. Knead the dough on a lightly floured surface until it becomes smooth and pliable. Form the dough into a ball, place in a greased bowl, cover, and let rise for about an hour or more, until puffy. Turn the dough out onto a lightly floured surface and fold it over several times. Divide the dough into 6 pieces. Roll each piece into a ball. Cover dough balls with a damp cotton cloth, and let sit for 10 minutes. Using a floured rolling pin, roll each ball of dough into an 8 to 9-inch circle about 1/8-inch thick. Heat a heavy frying pan or griddle over medium heat. Spray the pan with non-stick spray. Place dough round in the pan, and cook the first side until the flatbread starts to bubble and has some golden brown areas, about 1-2 minutes. Flip, and continue cooking until the second side is also golden, about 2 more minutes. Stack breads as they come off the griddle to keep them warm and soft. These look great! Thank you so much for sharing on Thursdays Treasures. I hope you will join us again this week. <3 and Hugs! yum. this looks really good.